Gorgeous and glistening, this shimmering silver bracelet presents pavé hearts each set with dazzling diamond centre-pieces. A delightful and dainty accessory, perfect for gifting to someone near and dear. The total diamong weight for this bracelet is 0.10ct. 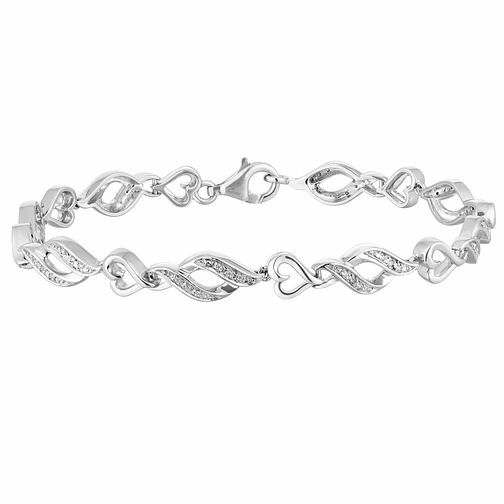 Silver 1/10ct Diamond Heart Bracelet is rated 5.0 out of 5 by 5. Rated 5 out of 5 by Anonymous from Silver 1/10th ct Diamond Heart Bracelet I bought this for my wife as a 25th wedding anniversary present and she loves it beautfully made, with diamonds made it the perfect gift as to represent our 25th silver wedding anniversary i would not hesitate to recommend this product.